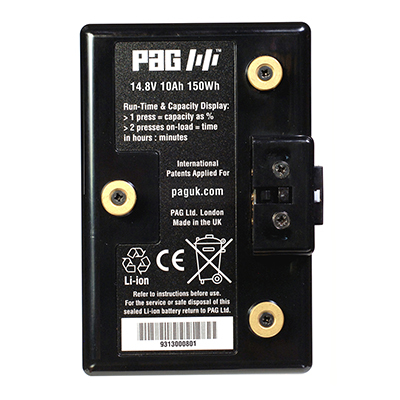 The PAGlink HC-PL150T is a high-current replacement for Anton Bauer Li-Ion batteries. The smaller and lighter PAGlink battery is compatible with the Gold Mount camera plate and with Anton Bauer Li-Ion chargers. 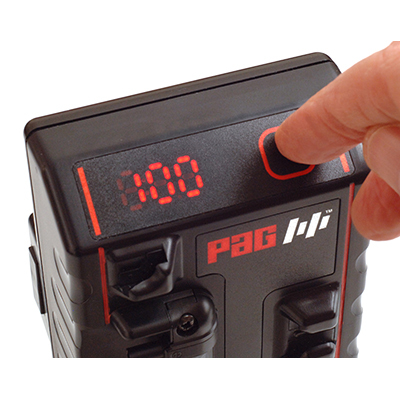 There is no need to replace expensive chargers in order to benefit from the many advantages of PAG’s revolutionary, intelligent linking battery technology. The PL150 takes advantage of the latest high-capacity Li-Ion cells in order to provide a greatly increased capacity of 150Wh, in the same enclosure as the PL94 PAGlink battery, and only 40g heavier. 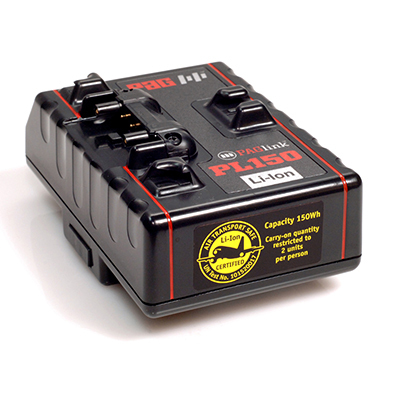 The PL150 is designed for high power-consumption applications, such as a digital cinema camera and multiple accessories. Two batteries can be linked, combining their capacities, to create a 300Wh power source, with a weight of just 1.5kg (3.3lbs) approx. ; linking three batteries provides 450Wh; no other system offers as much power. The PL150 has a capacity above 100Wh, but below 160Wh, and has an allowance of 2 units per person, in carry-on luggage, when you travel by air. Li-Ion batteries that have capacities greater than 160Wh are banned from passenger aircraft. The PL150 has been tested to UN standards by an independent authority and certified to comply with air transport safety regulations. As well as being more intelligent, PAGlink batteries are smaller and lighter, with a higher energy density than any Gold Mount system marketed to date. 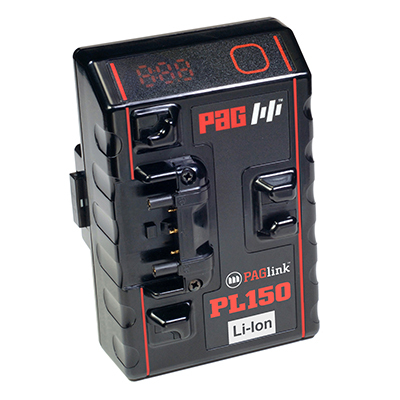 The PL150 can be linked to any other PAGlink Gold Mount battery for charge or discharge, regardless of rated capacity or state-of-charge. PAGlink batteries can be left stacked on the charger, which will keep them topped-off until they are needed, instead of self-discharging on the shelf. Cells: Premium grade Lithium-Ion sealed rechargeable cylindrical cells. Output Current: Rated maximum continuous output current 10 Amperes (12 Amperes for two or more linked batteries). The battery incorporates a multi-layered electronic protection system that guards against over-current, over-voltage, under-voltage, over-temperature and under-temperature. The protection system circuit is conformally-coated to protect it, and ensure operation of the safety systems in the event of damage to the battery. Charging: 0°C to +45°C (Optimum +10°C to +40°C). Discharging: -20°C to +50°C (Optimum +10°C to +40°C).